I consider watching The Croods movie over the weekend one of the best family film watching moments I’ve experienced so far. I’ve only wanted to watch it months ago when I saw its trailer because of my daughter. I love taking her to animated children’s movies even at her tender age. But after seeing it on the big screen, I’d like to see it again for myself. 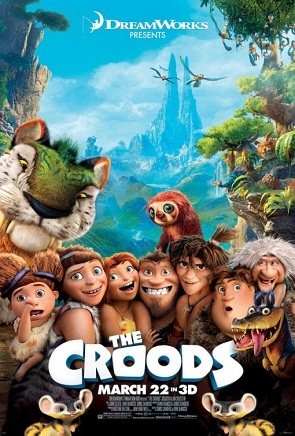 Set during the prehistoric era, the Croods, a family of cavemen who lives to follow the rules in order to survive hunts for food during day and finds shelter through a cave at night. They seem to be the only family left within their neighborhood. The eldest daughter Eep, however, is a curious one and gets in trouble with her misadventures. One night, upon discovering a ray of light coming from torch flames, she ventured outside the protection of their family’s cave. During which, she discovers fire for the first time through Guy, a nomad living alone with his pet sloth, named Belt which also functions as a belt, keeping his makeshift trousers up. With the single continent Earth slowly dividing to separate continents, the family was forced to leave their home upon the destruction of their cave. Guy led them on a journey towards safety through the highlands with several adventures and new discoveries along the way. Nicolas Cage is Grug Crood, the overprotective and old fashioned head of the family. Emma Stone is Eep Crood, Grug’s eldest daughter who is adventurous and curious. Ryan Reynolds is Guy, a nomad who does not rely on brawns but brains. He travels with a pet sloth named Belt. Catherine Keener is Ugga Crood, Grug's wife and is his exact opposite when it comes to idealism. Clark Duke is Thunk Crood, Grug and Ugga's son. Thunk is not as agile and is not very bright as his sister but has a good heart. Cloris Leachman is Gran, Ugga’s mother. Randy Thom is Sandy Crood, Grug and Ugga's baby daughter. Chris Sanders is Belt, Guy's pet sloth. 1. Discoveries. I have no idea about the accuracy of animals, plants, and places depicted in the film in relation to history but I love everything from the Grand Canyon-like caves, pre-historic animals which somewhat resembles modern day animals including Belt, the sloth; Douglas, Thunk’s pet crocodile pup; and the colorful gigantic tiger who used to be frightful for the Croods but became Grug’s friend in the end. There were other interesting animals too including the similarly huge hyena-like beast (which also became their friend in the end), the whale which walks and doesn’t live on water (where Thunk rode through at the conclusion of the film), carnivorous nocturnal birds who looks like piranhas but flies like birds, slapping monkeys, and more. Trees and plants were also enormous in height including the Venus fly trap-like giant flower and corn cobs which literally pops as fireworks in the air and delicious smelling popcorn when lit. 2. Family values. Nothing beats Grug’s dedication to protect his family. But he learns that over protectiveness is getting in the way of learning new ideas. Brawns don’t always solve problems nor can it feed a family. Brains should be applied at times such as when Guy devised a means to call for help through an animal horn, saved Eep from the carnivorous birds through fire (since they are afraid of the light), made footwear to be able to walk through pricking desert plants, and employed the use of puppet dolls. First was to lure a large bird into bait and become food on the table. Second was to pull him and Grug to safety when they accidentally landed on a quicksand-like black glue-y and goo-ey substance. Grug learned the value of being open-minded to ideas and came up with his own to escape from the other side of a divided mountain towards the opposite side where he threw everyone to safety. Anyone would cry while watching the whole family calling out to Grug with their horns. 3. Lessons Learned. In relation to the previous reason, I’ll reiterate some of the obvious lessons already mentioned. Brawns are not always applicable to every situation. Brains and ideas must sometimes be used instead. Although “curiosity killed the cat,” states that quote, the same curiosity led to countless discovery. So there is a time to be less traditional and be more open-minded to changes. Also, "never need not be afraid" should be "never be afraid." 4. Voice Over. The cast is definitely fantastic. I didn’t even notice it’s them until I waited to see the credit roll after the culmination of the film. Nicolas Cage, with his voice alone, is amazing. The same applies to Emma Stone. You won’t even recognize her voice as she seemed to have altered how she sounds a bit to fit Eep’s personality. 5. Stories. The family is fond of storytelling. Grug narrates their personal experiences and always ends up with the “curiosity killed the cat” moral lesson and anything new is dangerous followed by a slap of his hand in red blood ink on the cave wall. Cave men archaeological findings included scribbling and drawings on caves right? Guy, on the other hand had a speech about “tomorrow” and how we can all fly towards it. 5. Funny Antics. It’s hilarious to see any of the Croods reaction to Guy’s introduction of new ideas upon seeing it for the first time throughout the entire film. Every single character of the movie is funny in his or her own light at specific scenes on the film including Gran with her “still alive!” chant and how Grug gets disappointed by the sound of it every time. Belt and his “dun, dun, dun” tune with arms wide open as if on a finale is also amusing. There were all too many to mention here. Better see it for yourself. You can say that there was never a dull moment in the film. It’s exciting and entertaining from start to finish. Even my daughter giggled countless times. 6. Quotable Quotes. As always, I love quoting quotable quotes from movies. One of the best ones should include Eep’s dialogue at the end with the entire family riding towards new explorations saying, “we could stay right here or we could follow the sun.” It’s almost similar to saying you can either stay in your comfort zone or follow your dreams. Guy’s speech about flying towards tomorrow is also very optimistic. But the most unforgettable tag line is probably “release the baby!” That was Grug’s signal to release their dangerous little baby when hunting for food, just a giant egg actually. It is reminiscent of Liam Neeson’s line in the movie Clash of the Titans back in 2010. 7. Soundtrack. Shine Your Way by Own City and Yuna. “…all of our tears will dry faster in the sun, shine your way!” American Idol season 12 top 10 performed this during results night. If you haven’t seen The Croods yet, you should while it’s still in theaters.